Kinzi Poteet and Adam Cuneo peruse the course offerings of the new public relations online degree program. The Idaho State Board of Education has approved a new, fully online Bachelor of Arts degree in public relations offered by Boise State University. The public relations online degree will begin accepting applications in early March and enroll its inaugural class in fall 2019. Students will be able to choose a full- or part-time option. 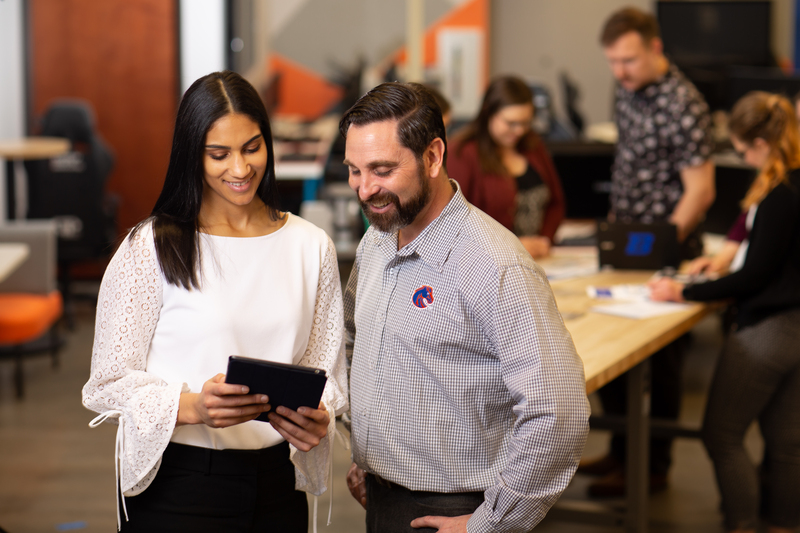 Boise State’s public relations online degree offers courses that are designed to integrate both concepts and practice, ultimately providing students with substantial experiential learning and a portfolio upon completion of the program. The university’s online offerings currently include more than 40 fully online graduate and undergraduate degree and certification programs, more than 500 online courses and nearly 3,300 students enrolled in fully online programs. The public relations online faculty will be the same faculty members involved in the campus-based degree; many have held leadership positions in public relations organizations and have practiced in the field. To learn more about Boise State’s public relations online degree, please visit https://www.boisestate.edu/online/public–relations. To learn more about all of Boise State’s online offerings, please visit https://www.boisestate.edu/online.